Ting is a mobile phone provider that uses the Sprint network, but charges a fraction of what Sprint and other providers charge. Instead of paying a monthly fee for a bulk number of minutes, text messages, and megabytes, you only pay for the minutes, texts, and megabytes you actually use. Ting uses the Sprint network, so everywhere Sprint users have coverage, you’ll have coverage… And for a lot less. I’ve had Sprint for years; I actually never had anything else and I almost never had problems with coverage. The only times I didn’t have phone coverage were when I was in very remote locations, but that didn’t happen often enough for me to pay more for those occasions. I’ve been using Ting for the last three months with the same success. The only time that I didn’t have coverage was in some parts of Yellowstone, but neither did AT&T. (Kate still has AT&T because she just switched phones and is under contract for another year and a half). I couldn’t really tell you about Verizon’s coverage in Yellowstone because nobody in our group had it, but I’m going to assume Verizon didn’t have coverage either due to the lack of cellphone towers in Yellowstone National Park. There were a couple of times where Kate had internet outside of Yellowstone and I didn’t. I only had reception for phone calls and text messages. So if you live right outside of Yellowstone and want to check your Facebook on your phone, then Ting might not be for you. We also spent a few days in Boise, Idaho and I had 4G everywhere I went. So far, my phone has worked everywhere except in some parts of Yellowstone. Now this is what has me excited and glad I switched to Ting. Prior to my switch, I was paying $127 a month for two phones with Sprint. That’s $63.50 per phone. And that’s including a 25% corporate discount, so I’m guessing most people pay more. With Ting, I have paid $103.87 for two phones for THREE MONTHS of service!!! That is $34.62 a month for two phones or $17.31 a month per phone. Granted, charges may vary according to your usage, but $17.31 a month for the same coverage I was getting at $63.50? It doesn’t take a genius to figure out that math. Okay these numbers might be a little misleading because I got a $25 credit when I signed up. You can claim your $25 credit here. * So the first month I only paid $19.55. The second and third month I paid $42.16 each month for both phones. For those doing math, that is $19.55 + $42.16 + $42.16 = $103.87. If I would’ve stayed with Sprint, I would have paid $381 for the last three months. So by switching, I have saved myself $277.13 in three months. I was paying more in one month with Sprint that I have paid in three months with Ting… for the same service!!! 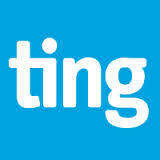 I am extremely satisfied with Ting and I will never, ever, ever go back to a major cellphone provider. It’s just not worth it. One of the many great things about Ting is that you can use any phone you want: iPhone, Android, Windows, etc., as long as it is a Sprint phone. If you don’t have a Sprint phone, you can check out the Ting store for a new, used, or refurbished phone, or you could trade in your phone for the same Sprint phone. You can also keep your number when you switch. You will save a lot of money just by switching to Ting. And you can get credit for referring a friend, which will save you even more money. You can use my referral link below and get a $25 credit while helping me get some credit as well. One last thing, you don’t have to sign a contract with Ting so you can give it a try and if you don’t like it, you can always go back to paying hundreds more. Have you considered paying less for your mobile phone? I would be all for trying Ting or Republic Wireless if Sprint Coverage was better where I work at. I have used Sprint through Boost and through themselves, so if I end up working somewhere they have decent coverage or retired I will probably shift to something like this. I am glad it is saving you some money! I also have shaky reception at work. Well, I have talk and text reception, but the internet is shaky. The good thing is that I have a computer at work with internet and two monitors so that’s really not a big deal for me. Glad that Ting is working out for you. It’s really about finding a product that truly meets ones needs for the cheapest price possible. My DH and I travel outside of the US often for work so we absolutely need a carrier who can provide solid data/phone service internationally and I also communicate a lot with family, friends and associates in Canada. We’re using T-Mobile’s simple choice plan solely because of the reliable coverage outside the US. I am so envious of cell carrier options outside of VT. We only have two carriers that offer reliable coverage right now. I may have to check out the sprint network and coverage before I take the leap. I pay about $55 with discount and in a family plan. Those are some pretty huge savings just by switching providers! The Ting business model is actually something I fully endorse: pay for what you use. Instead of the same amount every month for a service you’ll use to the fullest one month and hardly the next, you’ll most likely be more conscious about your usage and hence your bill. I love finding out about these cell phone alternatives. We recently just got Verizon down to the point that we needed it, so we are staying there for now, but I always love feedback like this for my clients. I have never heard of Ting before. We’re on the Sprint network so perhaps it would be worth looking more into. The prices certainly seem pretty good! Ah, stay away from Southwest Colorado as well. Only Verizon and AT&T work well here. I am always hopeful service will improve with time and I can take advantage of some of the less expensive services. My husband has Ting and loves it. He doesn’t do much talking or texting so his bill has been $27 the past few months. Hard to beat that for full service on an iphone 5! Good to know that you’re so happy with Ting. Mr. FW and I are really, really fortunate that our employers pay for our phones right now. But, when we retire early, I think we’ll be switching to Ting! Sounds like that is working out great. I did not know this kind of service existed. I left Sprint a year ago because we could get a better price with AT&T. I love how companies are popping up to give consumers choices. With large families, cell phone plans can get way pricey. Just wondering, does it work with unlocked phone as well? It sounds like a great plan for someone who doesn’t actually make calls or text that often. I often find phone plans to be too superfluous for some of my needs, but too little for my other needs (like unlimited phone calls but only a couple of hundreds megabytes for internet). Ting sounds like it could feel the gap. I’m not sure if it will work on all unlocked phones since “unlocked” is usually referred GSM-only devices. You need to make sure your phone is CDMA which is what Sprint’s network uses. You can check out the link below to see if you can bring your phone over to Ting. Just select your current provider and enter the ESN/MEID of your phone. I’m clearly paying way too much. This post is further illustration to me of why I need to focus on trimming cell expenses, as they can really add up over time. Thanks for sharing, as those are pretty low expenses you have!